MENASHA October 21, 2018 -- Harvestime Kennel has been selected for the 2018 Best of Menasha Award in the category by the Menasha Award Program. Each year, the Menasha Award Program identifies companies that we believe have achieved exceptional marketing success in their local community and business category. These are local companies that enhance the positive image of small business through service to their customers and our community. These exceptional companies help make the Menasha area a great place to live, work and play. Various sources of information were gathered and analyzed to choose the winners in each category. The 2018 Menasha Award Program focuses on quality, not quantity. Winners are determined based on the information gathered both internally by the Menasha Award Program and data provided by third parties. I don’t know how to find the words to express my deep gratitude for your kennel breeding program. You make it seem effortless (but NOT easy). You provide useful, applicable, current info so that we and our new puppy mesh as easily as possible. Ripley is my 5th dog, and the most amazing to date. He is smart and funny. A focused problem-solver, he is rarely intimidated. He absolutely adores all the people that he meets, and is very unflappable in new situations. He self-entertains between training sessions by methodically emptying the toy box of each toy and playing with each one for quite a while, almost as if he were taking inventory. He has won my husband’s heart, a VERY hard thing to do (we lost our 16 yo Boston this summer, his dog, and he swore he would never fall for another dog—haha, too late, honey!). So, whether it is nailing his recall coming in from the yard, sitting politely for treats, holding a sit as I put down his food dish, or just checking in and looking deeply into my eyes, he has truly wrapped his paws around my heart. Just tonight, as I held him as he was getting sleepy, I told him that I was the luckiest dog moms in the world. I can’t imagine how challenging your life is; it is certainly filled with great highs, but I know that there are also deep lows. Never doubt how appreciated you are. Never. The joy that you give is life-altering. I have to share a little story with you. About a year and a half ago, we sat near a family with the most beautiful puppy. I had pointed the pup out to my husband, and told him that that was the kind of dog i wanted. As we sat near them, we started chatting, and the family told me where they got her, and i went on your site and got on the list. Eventually we got our own Harvestime pup! Hi Deb, we just wanted to reach out and let you know how WONDERFUL Leavitt has been!!! He is such a calm and sweet pup, and is learning to get long well with our adult cat! He is steller in puppy classes and puppy socialization classes, always managing to find the calmest dog in the group to play with. He's also great with timid and shy dogs who haven't come out of their shells yet! Potty training is going really well, we haven't had an accident in weeks. This is also quite the feat considering we live on the 4th floor of our condo building - he's also never had an accident in the hallway or the elevator! The Fourth of July was quite a testament to your kennel because he was completely un-phased by fireworks and has never gotten skiddish from loud noises (wish our cat had the same training that Leavitt had!). We love that you got the pups used to all these loud noises in advance!! I thought you might like an update on Cass. I wanted to wait until he saw my vet, who says that he is a perfect puppy. By the way, she commented a few times on what a responsible breeder you were. 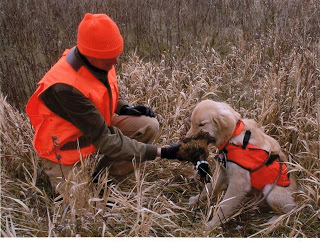 Since I am a Research Engineer, I have been researching various breeders around the region and I am extremely impressed with your Harvestime Kennel above all others! I especially appreciate your diligence and attention regarding your bloodlines and that they are maintained for healthy generations. I just thought you might like to know that we had Fiona (LILA, 10 years old) at the vet recently and they are amazed at what good health she is in…..her blood panels came back perfect….liver, kidney, etc. We were thrilled to have them say she is in excellent health. We continue to love her and be grateful for your gift of her adoption. Finn was at odds all day while she was gone……it was cute to see him hug her on the way home from the vet. Your dogs have become our family members. Clancy, Finn and Fiona are/were all so very important in our lives. Visiting your home to see you and puppies is one of our favorite things to do. It makes us feel better about the world we live in. Golden! We've had many dogs over the years, but Travis is amazing! Besides being adorable, he's smart as a whip, content and loving. Your methods make it simple to house train. He knows what to do the second he gets placed outside. Hi Deb & Stacia,Wanted to give you a quick update on our puppy, Malli Mae.She just graduated from Puppy Preschool and is starting her next set of classes next week and on her way to becoming a therapy dog. Over Christmas, we had lots of friends and family over and everyone was so impressed on her beauty and what a calm Golden puppy she is. We get compliments all the time from everyone that meets her. I just wanted to send you both a quick update on Finnley. He is doing great and settled in so quickly. I am impressed by how smart Finnley is. He's already figured out that the correct spot to do his business is out in his kennel. We've only had a few accidents and those were when he got overly excited. Tiffany, you did an awesome job socializing Finnley. I cannot believe how great he is with everything. I can vacuum, run the dishwasher or make other loud noises in the house and he could care less. Finnley has quickly won over both Steve and I and our families. We can't wait to watch him grow up! Just two of the wonderful pups you have worked so diligently to produce. Beautiful. Healthy. Composed. I can’t imagine how challenging this life you have chosen is. I just want you to know how deeply grateful I am that you did choose it. And that you continue to evolve and grow with all the up to date info that you so clearly share with us. I hope to eventually get at least one more Golden in my life. I pray that you and your kennel continue this difficult and rewarding work. When you are having a rough day, please remember how many lives you have touched with your dogs and know how much you are loved. Hello Deb, Both Janet and I have intended to contact you. We have been busy caring for the greatest puppies of all time! There simply are no words to describe how thankful we are to you, and to Rob, for breeding and raising such amazing dogs. 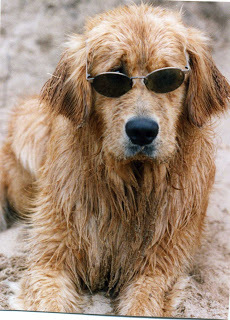 All Goldens are special, but your dogs are extraordinary! They are smart, loving, eager to please, gentle, wonderfully tempered, great with other dogs and people, and so on......... Plus, they love to smile! We are in love...... with both our puppy, and my parent's pup. Ryan, Hayden and I instantly fell in love with Milo and have been busy training him. He is very trainable and loves his new family. Milo walks our son Hayden to school each morning and he cries when "his boy", Hayden, enters school grounds. Milo runs into numerous dogs with varying personalities and he responds well to all of them. We also cared for Milo's brother, Finley for 2 weeks while Janet and Bob were on vacation. It was a lot of work, but a joy! I never would have imagined that caring for 2 puppies would be so enjoyable, but it was, simply because they are both Harvestime Kennel dogs. I could go on and on about how impressed and thankful we are to have been so blessed by your family. A million "thank you's!" I would like to take credit for advertising and spreading the good word about Harvestime, but Milo and Finley have done all of the work themselves! Our neighborhood, and many parts of Bozeman are abuzz with the name of your kennel. Numerous cars and bikes have pulled over to meet the puppies over the past 2 months and melted at both their beauty and great dispositions. 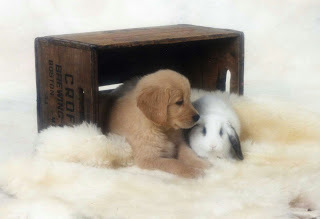 We eagerly share the joy of purchasing puppies from Harvestime. Thank you again. Your family and Kennel will remain in our prayers and well wishes. I wanted to drop you a quick e-mail to let you know that we have been thinking about what a wonderful family you are and how thankful we are for having our beautiful puppy, Lia. She is a joy from morning until night and you couldn’t have done a better job in picking the PERFECT PUP for us. Just an update for you on Tessa. We still could not be happier than we are. Tessa is a GEM!! She is super smart and observant.She notices any little change from the ordinary both inside and out. She recently discovered that water is not solid and she can swim. I have a Koi pond that is 5 feet deep. Chasing a leaf into it was funny. She swam right out. She is only on a lead when we walk. She heels and sits automatically when stopped. Stays around us in our yard and comes right away when called or whistled for. 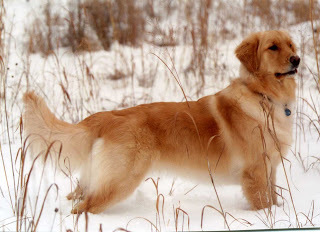 Everyone wants to know where she came from and remark how this is the most beautiful Golden they have ever seen. Sleeps all through the night 10 pm to 6 am. 95% house broken. Still can have an accident if she is "too busy" playing with Toby. Stops right away with a clap -then runs to the door. Sit, stay, come, down are all solid. Hi Deb! Thought you might like an update on how Bella is doing. She is growing up fast and becoming such a sweet and loving dog. Everyone that meets her falls in love with her and that's EVERYONE because no one is allowed past her without petting her if she has anything to say about it. Walks around the neighborhood can take us awhile when having to stop when anyone passes. She has become a huge fan of going to the front lawn of the nearby high school to run around with other dogs in the neighborhood. We go almost everyday. She also is turning into a water dog and has recently discovered the beach. My mom walks her there almost every week day morning and she has other dog friends there she likes to run around and swim with. I just wanted to reach out to you and say how happy we are with our "Texas" boy Cosmo. He is doing great in all aspects; he is a very happy and active puppy and is excelling at his training in general and his service dog training! 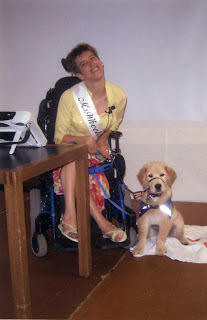 By now I'm sure you've linked Cosmo and Maureen Bennett of IDEA service dogs. She loves Cosmo almost as much as we do. I don't know if you recall but we adopted the most beautiful little girl from you 2 years ago last January. We are looking to adopt again and provide Bailey with a playmate. We were wondering if you'd clone Bailey's wonderful personality, her gentle nature and loving tendency we would be in heaven. Hi Deb, Today Scout turns 2! Thank you! Scout is the most outstanding dog we have ever had! While it is true, we have put in a lot of time training Scout (every session a total pleasure), you must take an enormous amount of credit! Because of your skill as a breeder, combining dogs that not only have great beauty, but good health, a solid structure, great personalities and intellect, Scout is the best girl ever! The best dogs begin with the best breeders! So again, Thank you so very much! Scout is the light of our life. She excels in obedience; she loves all people and other animals (she has even won over the old cranky cats); she loves to play in the yard with people of all ages and go for her daily walks; she loves to go to doggie day care once each week to play with her buddies & go in the pool (she can be quite a clown); she loves to work; she loves to visit hospital/nursing home patients (she brings a smile to the face of every patient) and still she remains a true cuddle bunny, who adores being petted and talked to. She totally lives up to her name "Scouting For Blessings". Everyone that sees her remarks about her tremendous beauty and her sweet disposition. We give out your name quite often, when people ask where on we found such a beautiful pup. Hi Deb...The Priestley's just wanted to let you know how happy we are with our cute little female our kids named Riley. She is from the Timber/Faith litter that were born on Easter. Her temperament is just amazing, friendly to all, lovable beyond words. She has been so easy to work with, potty training went real quick, sit, stay, lay down, walks with a loose leach right next to us on our left side, will sit and stay at the park while we walk to the other side without moving until I clap my hands, than a mad dash to be hugged and petted, place a treat on the floor, she will not take till we say ok, the temperament and smarts that no doubt are bred into your pups is obvious. The only negative is that 4:00 am she hops up onto my the side of the bed and paws me or licks my face which tells me time to go outside, hoping that ends soon but thats the life of a puppy owner, right? She is just gorgeous, light tan, a white strip on each shoulder blade, long tail with floppy ears, anywhere we go we get stopped, if I had a dollar for every time I heard, sir, can I pet her followed by the words, she is just beautiful I would be retired right now. The women at the vet just gush over her and they moved there lunch breaks around so they could all hold her as she was coming to after her spay surgery, kinda cool. I even told them that you say this to every client that brings there dog in and they swear she is one of the cutest pups that has ever come in, I guess that's a feather in Harvestime Kennels lap. If I had a dollar for every time I mentioned Harvestime Kennels to someone I not only would be retired but be sitting on some remote Island in the Caribbean. I just wanted to write and say thank you for the time and effort you put in your dogs, it is evident in what we have in our dog. Hi Deb, I was just searching around on the web and thought I would try to find you. We bought a golden puppy from you almost 4 years ago, you described her as a couch potato and that she is! We love her so much and are so thankful to you and your family for the wonderful job you do breeding such loving, kind, sweet, gentle dogs. Jasmine is a joy every day for our family. We receive so many compliments about her gentle nature and just about her in general. We had just lost a golden to cancer when we came to see you, it was my daughter and myself. In fact we left saying we had to think about it, then came back within 15 minutes and are so glad we did. 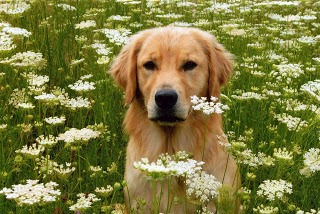 Thank you again for your love of Goldens!